Franchot Tone is a pacifist English lord who weds his Austrian servant, sultry Veronica Lake, not realising she is a German spy helping the Nazis plan an invasion of England. It sounds like fun, but this propaganda piece, made at the height of the Second World War, is unremittingly earnest and none too convincing. Adapted from one of Somerset Maugham's lesser works, it puts too much strain on Lake's histrionic reserves, while Tone seems bemused by the whole business. 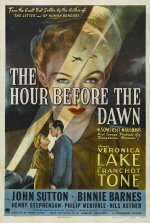 Lake's period as a superstar was brief, and though she was to make one more good film (The Blue Dahlia in 1946), this marked the start of her decline.